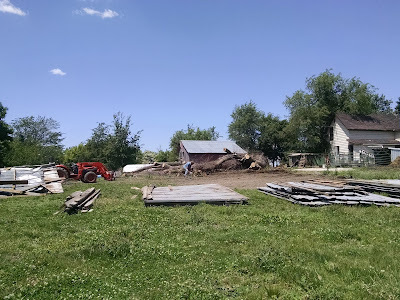 To the right, the original 1865 house we use for storage, in the middle is our current feed shed, and in the foreground is the first two loads of the old machine shed being organized into piles for the rebuild of the barn. What we thought was such a great idea, find an old building for cheap, tear it down, build it back up, has turned out to be a real shambles of a mess. The man we hired to dismantle the old machine shed down did a fine job the first two loads, then; he got tired, or lost interest, or saw a purple moon or something. Keith ended up helping with the third and fourth loads and the last two loads might have been better just dropped off at the local landfill. Here's the gist. The walls of the building were deconstructed well, a few dings but that is certainly to be expected. 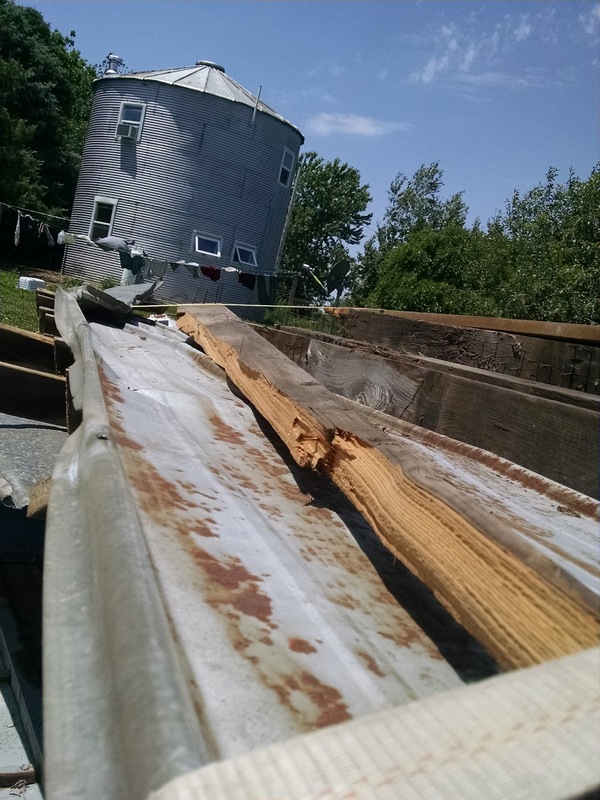 The posts and framework remained intact. But when it came time to deliver those loads to us, this guy didn't have the staff, so Keith got involved with the hauling part. 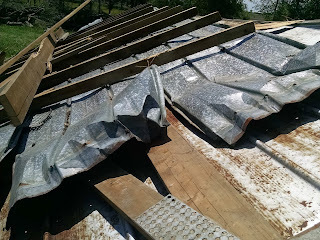 Then when it was time to remove the metal roofing, our guy lost his head. We weren't there. Instead of detaching the metal roofing sheets from the trusses and then dismantling the trusses themselves, he cut the 2 x 4's that held the trusses together, thus compromising the entire roof structure. 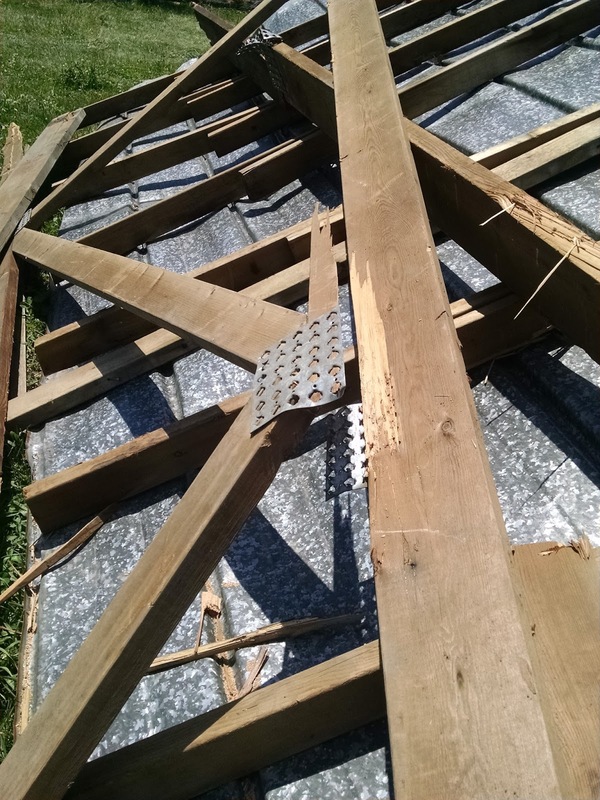 Entire pieces of the roof (still attached to the wooden trusses) just fell to the ground. It's a miracle no one was hurt. Yes, we did verify he had his own liability insurance before we hired him. Even his own staff later told Keith, "we argued about him doing it this way but he wouldn't listen." When Keith arrived on the site after the damage was done, he was told by the man we hired, "Don't worry, you can patch up those trusses." No. we will not. Many are shattered, splintered is the word I am looking for. The 2 x 4 's that held the trusses together have been cut through and the metal roof sheeting bent so badly in some areas, it cannot be straightened. 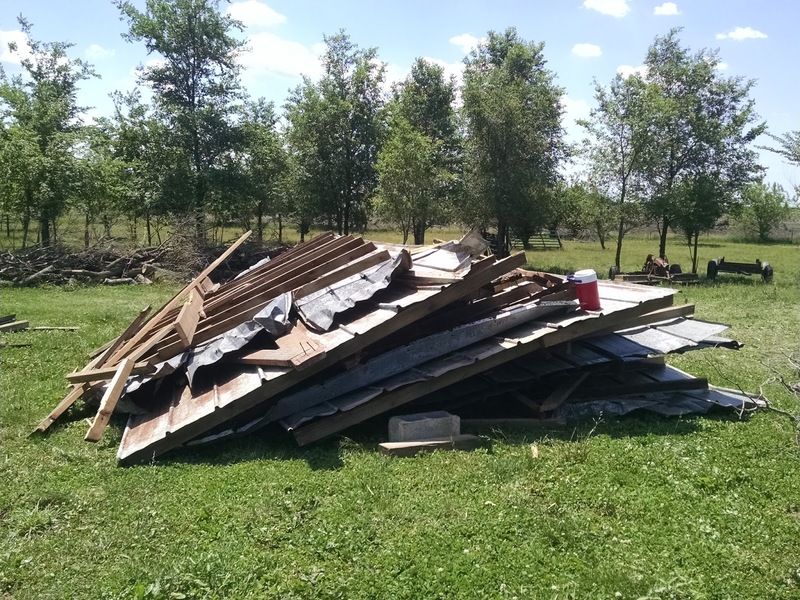 We had agreed to pay $3000 for this task of dismantling the entire shed, and delivering it to us, but since Keith ended up pulling three trailers home loaded down without new building parts, and much of the roof has now been destroyed, we have so far only paid him $500. 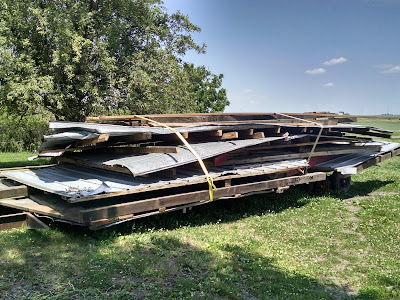 After Keith and I pick through the last trailer full of eviscerated roof sections, we'll know how much we'll have to spend to replace those pieces. Then Keith and our guy, who won't ever be "our guy" again, will negotiate a fair wage for the work done...and not done. It is so frustrating, We needed to save money, we like giving business to local folks, we have worked with this gentleman before, but our ability to trust others is waning. It is circumstances like this that send newbie homesteaders running and screaming, back to their rent controlled condos. But not these two seasoned live-off-the-land nut jobs. No, we're too dumb to know when to quit. So, we have a couple options. 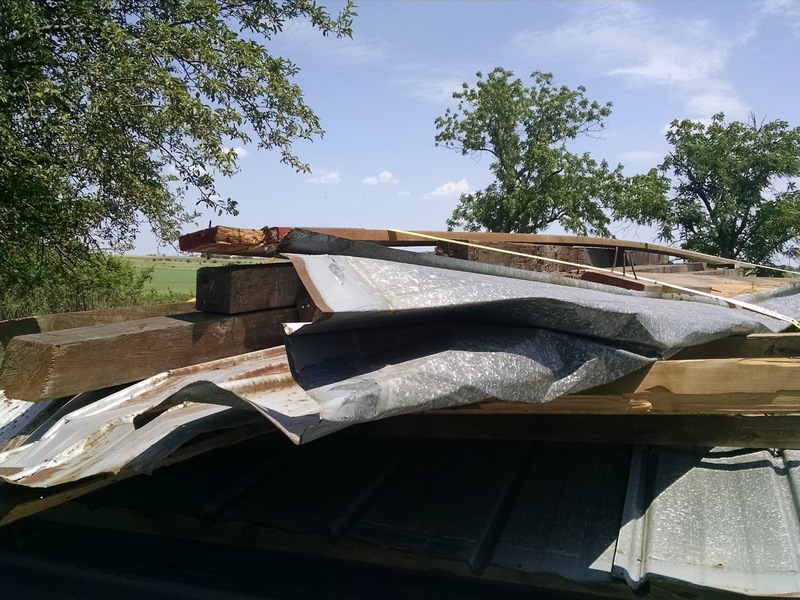 Use some of the wall siding to replace the metal roof panels that were destroyed, leaving us with a much smaller building than we need, OR dig deeper into a rapidly dwindling savings and purchase the metal and wood we need to build a new roof. 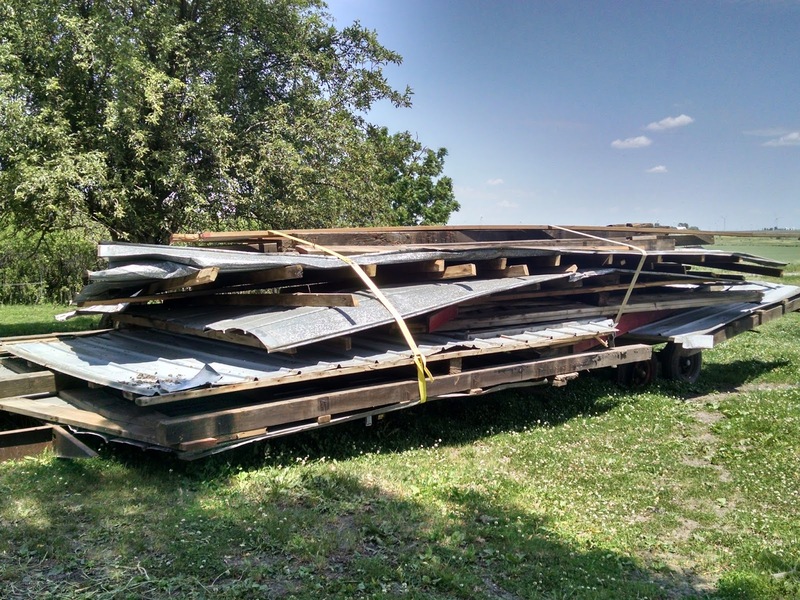 We won't be able to make this decision until we unload the last trailer full of barn parts that were deposited in our yard last week. We're not looking forward to this task, afraid it might be even worse than it looks, but when done we'll at least know where we stand. 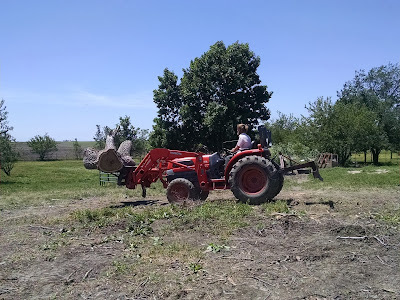 In the meantime my husband has done an amazing job of clearing all the wood from our felled elm trees so that now we have a spot to build the barn, or at least part of it! Oh dear; oh dear. I know that ancient barns are taken to pieces over here, but they are usually very substantial buildings, and each piece of the structure is marked and recorded. It doesn't look as if the same care has been offered in your case. I know you'll both find a way of putting it back together again, but I must say I'm glad It's not me who's doing it. I look forward to seeing pictures of a perfect, newly assembled barn in the very near future. Thanks Cro, we look forward to seeing what we can do as well. now that the shock of the damage is wearing off, we are getting hopeful again. My Keith is a talented man, if anyone can salvage this barn, he can. If not, I guess the livestock will board with us this winter. Lots of pictures will help your case if he takes you to court. Get the names of his helpers. If they complain about this job, they may be unhappy with other things he has done. It is a shame you lost so much good material. No worries Linda, this guy won't be suing us nor will we sue him. It's over and done with and we're all moving on. We will we will we will. My new mantra. oh i am so sorry this happened to you. i would be pissed big time! the gas company did a project on our street and totally ruined our fencing. now we have to fight with them to get it fixed. they broke our entire sidewalk and compromised trees and shrubs too. grrrrr!!! Dang those utility companies! I hope you get an even better fence in the long run. I'm gutted for you, just a little more care from that guy would have saved you loads of work and loads of money. I can imagine your disappointment, I remember being on a job and gettting some lads to take a fireplace out that I would have sold and split the money with them, they rushed and did it like idiots and broke the thing in two making it worthless. Never mind these things are sent to try us! Hope to see the new barn up soon! It's all good Kev, it really is. 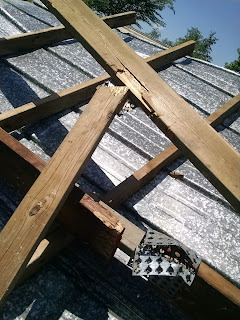 No one was hurt, my husband and I are still healthy enough to rebuild the building (well today we are) and it motivates me to learn even more carpenter skills. Life is a bowl of cherries, we can handle a few pits. Sorry to say, but that's exactly the kind of "great service" & "attention to detail" that we encountered when attempting to "hire locally" & "build relationships in the community". I hope you had a written contract. We have lived in this area over 25 years and worked with many local folks on a hand shake alone, but you may be right. That kind of business deal is waning. I think this guy may have some early dementia and as I said, I am most happy no one got hurt. Oh dear, it's like we learnt a long time ago, if you want a job done properly do it yourself, or stand over whoever is doing the job. I do hope you manage to selvage enou8gh for your needs without spending too much. Oh dang it, I'm sorry this happened to you. It's one of our fears when we have things done at the farm. I hope you can salvage the good parts and get something good in the end!! In 24 years of farming together we've worked with literally hundreds of people in our business of organic meat production. Contractors, customers, friends. We've had just two raw deals, both in the last year. Statistically, we're doing ok, and so will you when you hire help. The most excellent advice ever! We're moving ahead. Oh, what a terrible disaster for you. I hope you can put it right without too much extra expense! Like I said, we're happy no one died. We don't have the permit for our private family cemetery yet!